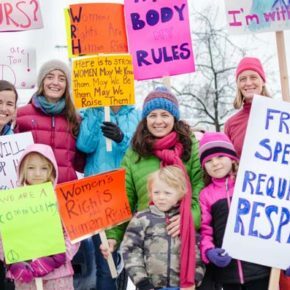 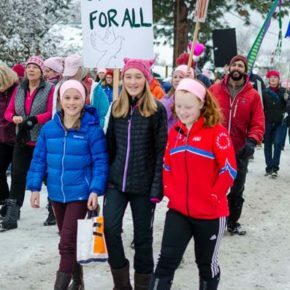 Every age group and gender was represented at Twisp’s march for human rights on Saturday. 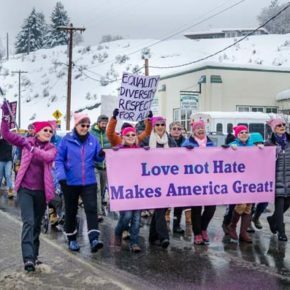 For more photos from Saturday’s marches, see galleries below. 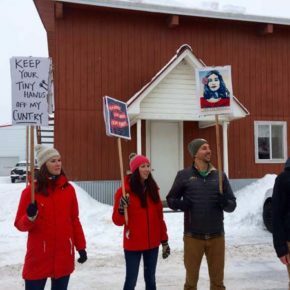 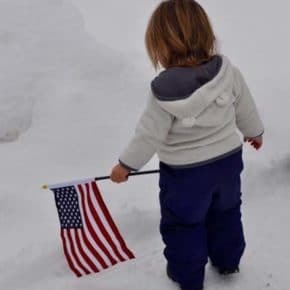 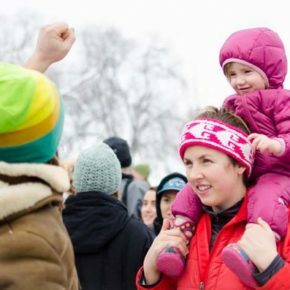 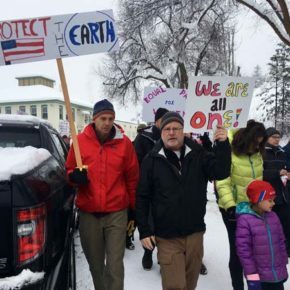 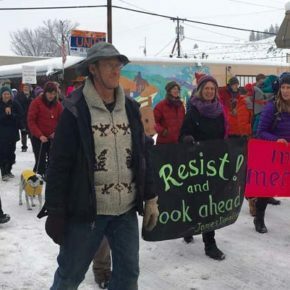 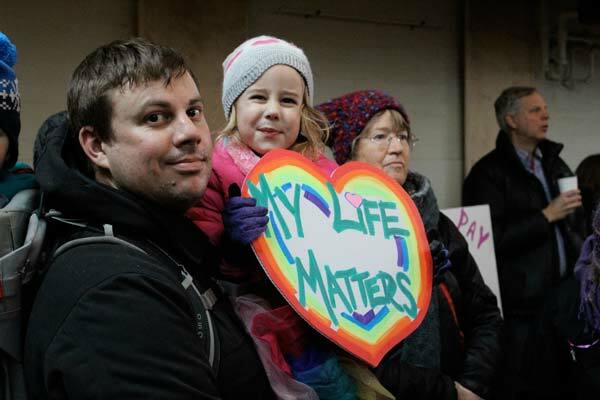 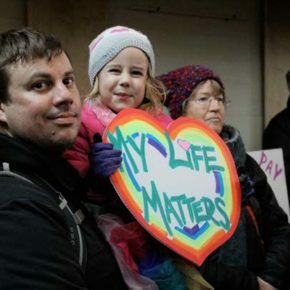 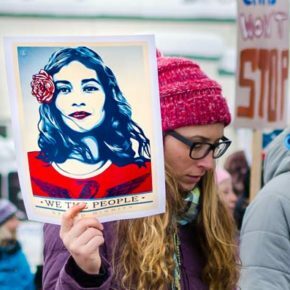 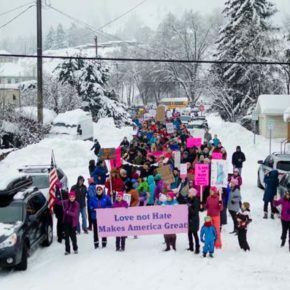 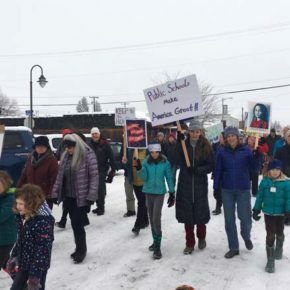 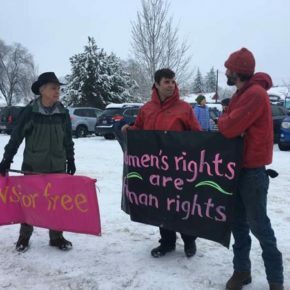 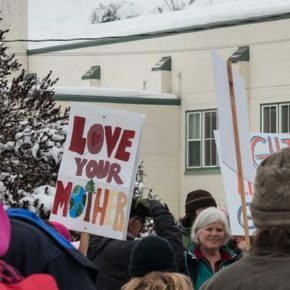 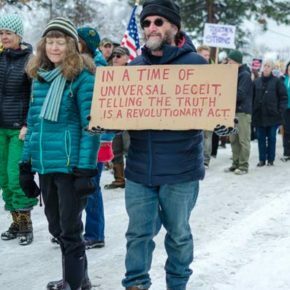 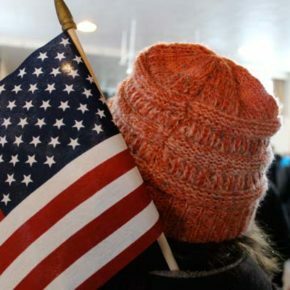 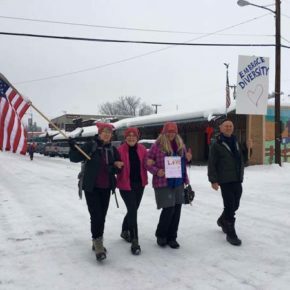 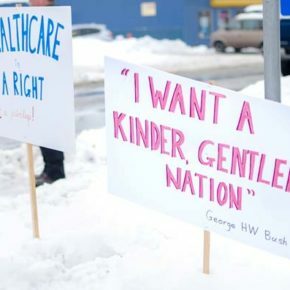 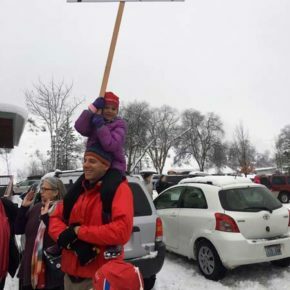 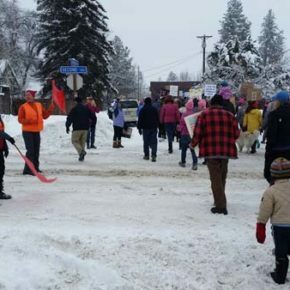 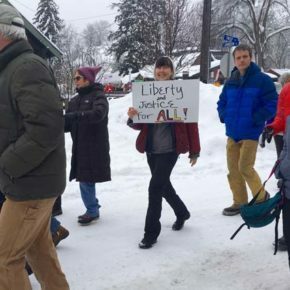 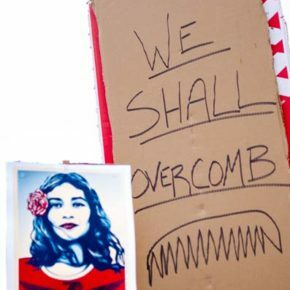 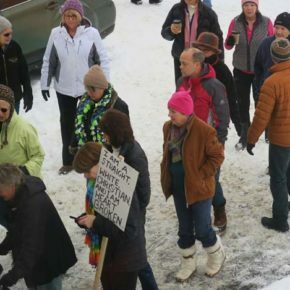 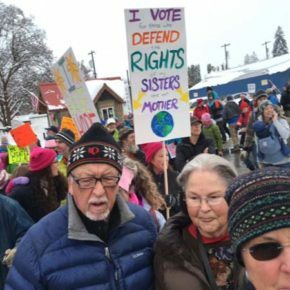 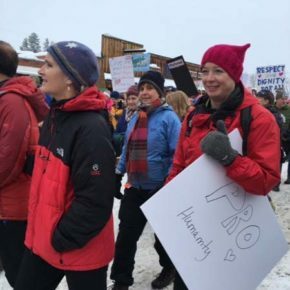 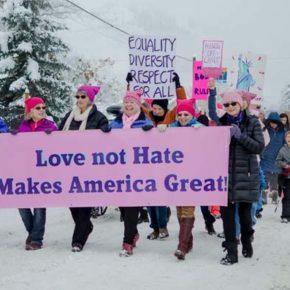 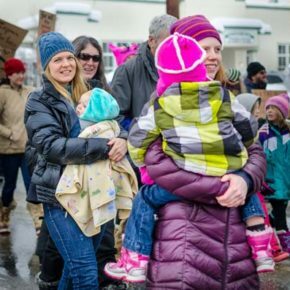 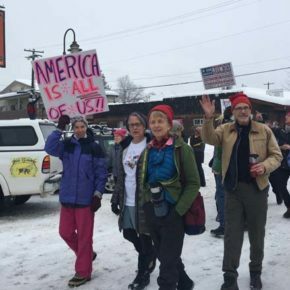 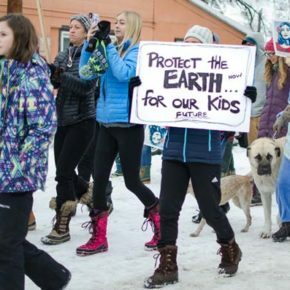 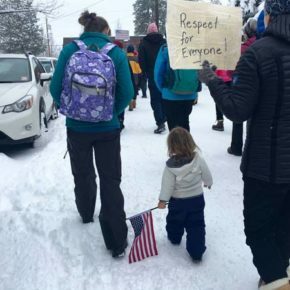 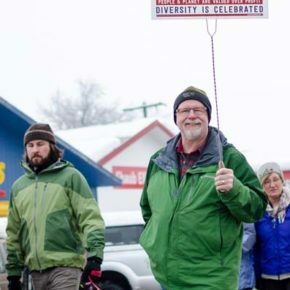 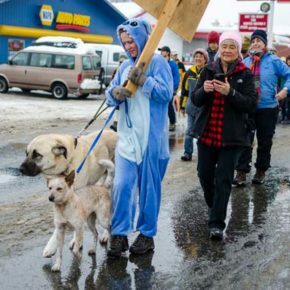 Whether they stayed here in the Methow Valley to march through Twisp, or traveled to Seattle, Washington, D.C., or elsewhere, hundreds of local women, men and children walked with millions of others around the world last Saturday (Jan. 21) in a show of support for human rights. 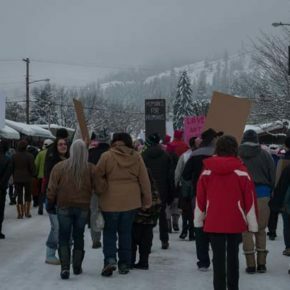 Here in the valley, an estimated 600 to 800 marchers walked through Twisp, a significant turnout for a community this size. 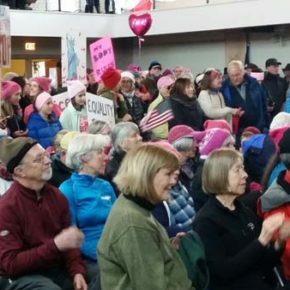 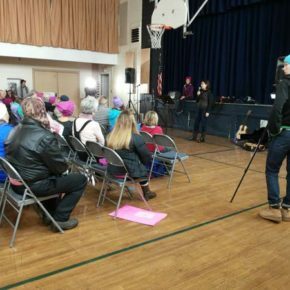 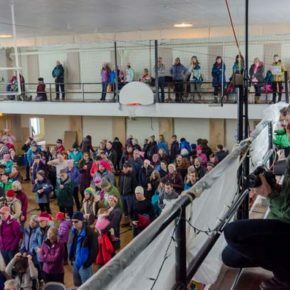 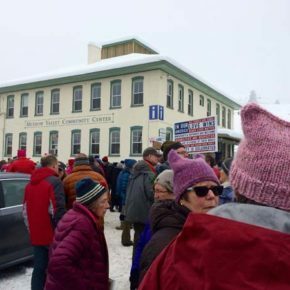 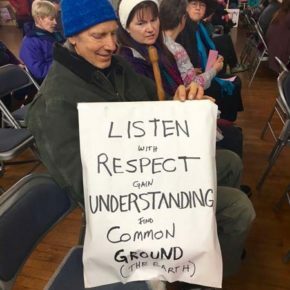 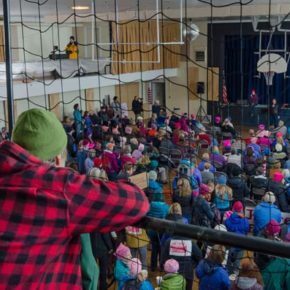 They gathered at the Methow Valley Community Center after the march to hear speeches (see the text of those speeches here and here) and music. 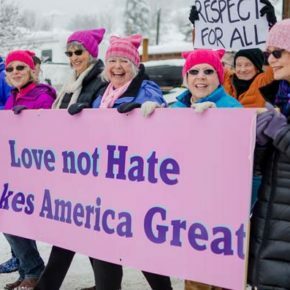 See video of the march here. 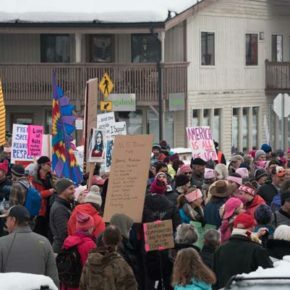 The Seattle-area march drew many people from the Methow Valley. 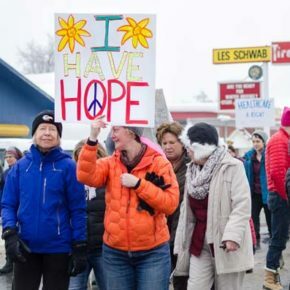 For more photos from Saturday’s marches, see galleries below. 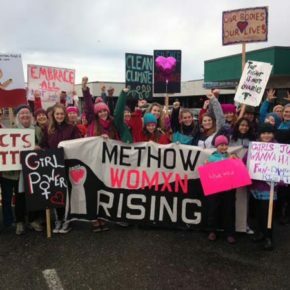 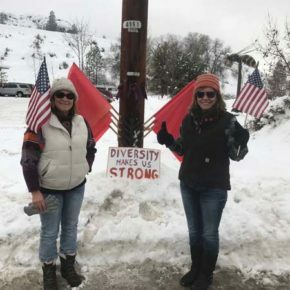 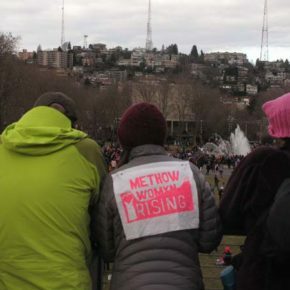 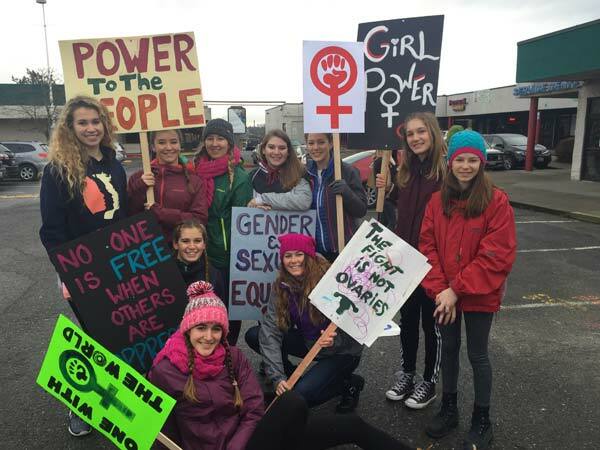 More than 50 people from the Methow Valley, including several mother/daughter pairs, traveled snowy roads to Seattle for the Womxn’s March. 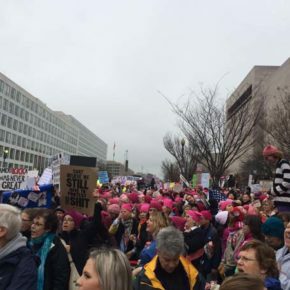 The march drew an estimated 100,000-140,000 people — far surpassing the expected crowd and breaking records for previous demonstrations in the city. 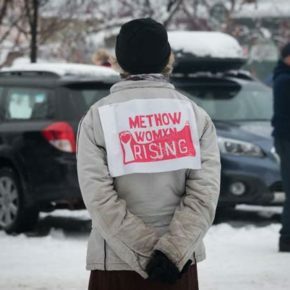 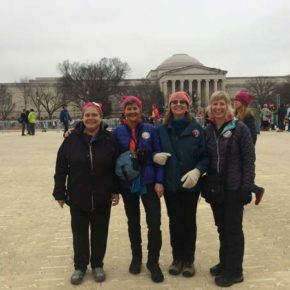 Several Methow women made the trip to Washington, D.C., to join nearly half a million people in a show of solidarity. 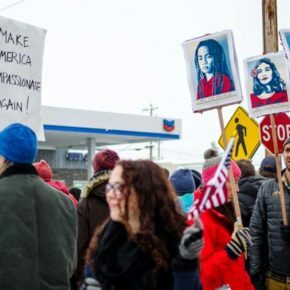 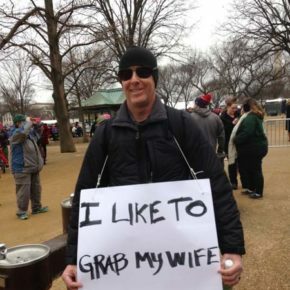 Although the protests grew out of concern and anger over the views expressed by newly inaugurated President Donald Trump, participants said the mood at the marches was exuberant and defiant. 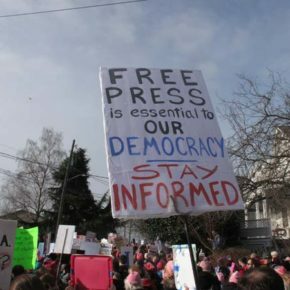 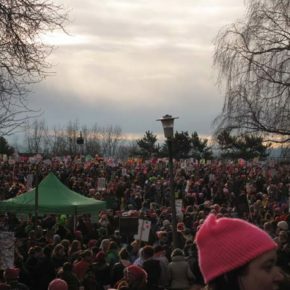 Participants in Seattle and Washington, D.C., said the crowds were so large that at times the marchers were gridlocked and had to stand in place before they could move forward. 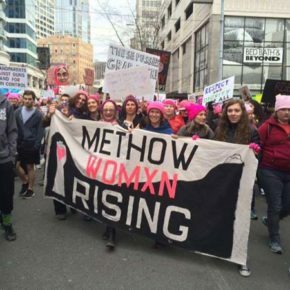 Marchers chanted and sang, and in Seattle the crowd would periodically burst into a roar that rolled through the procession from one end to the other like a wave. 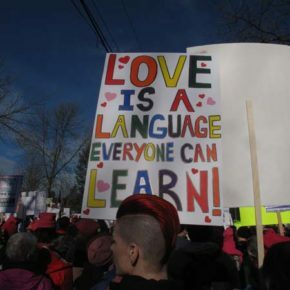 The messages carried by marchers spanned a gamut of issues. 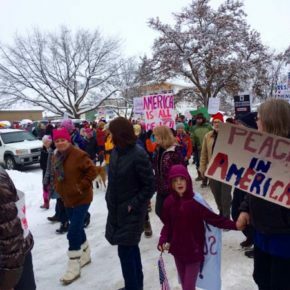 For more photos from Saturday’s marches, see galleries below. 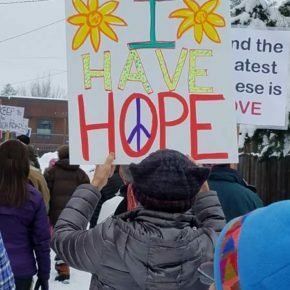 Marchers carried handmade signs on themes of civil rights, women’s rights, tolerance, climate change, health care and opposition to Trump. 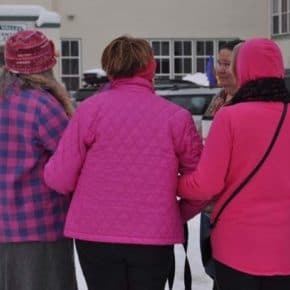 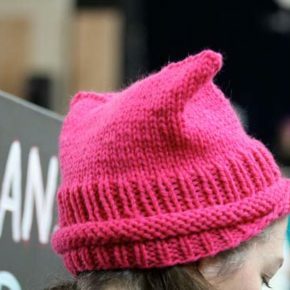 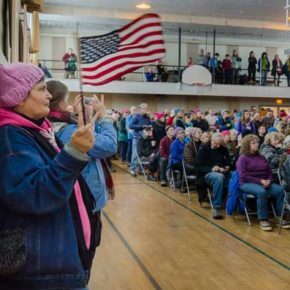 Many wore pink knit hats that have become a symbol of solidarity and support for women’s rights. 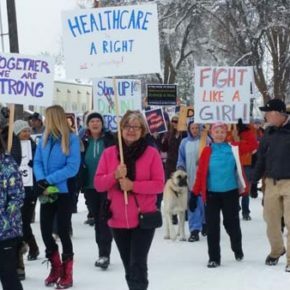 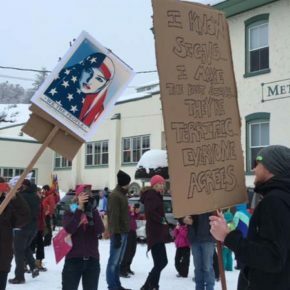 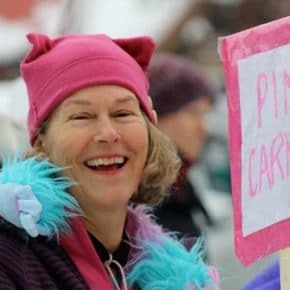 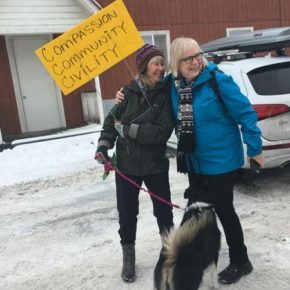 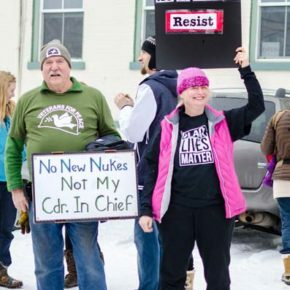 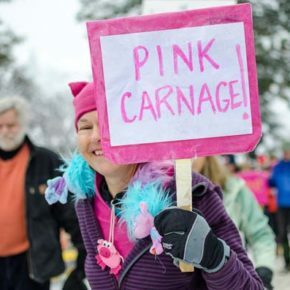 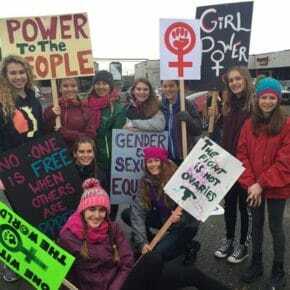 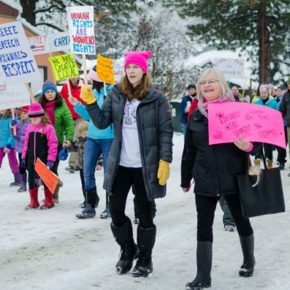 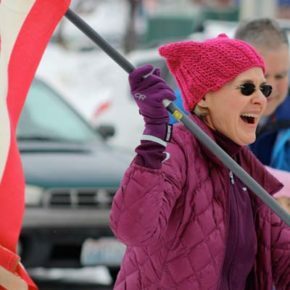 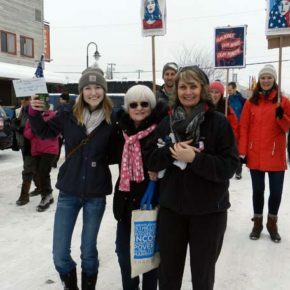 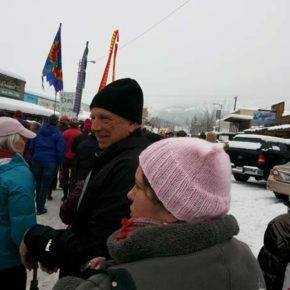 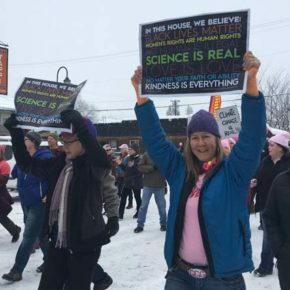 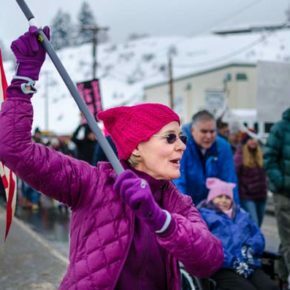 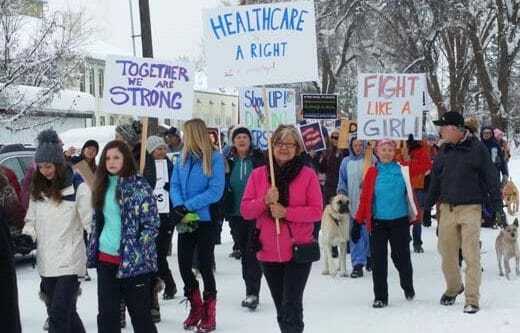 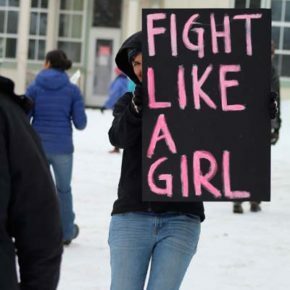 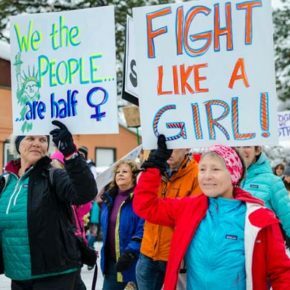 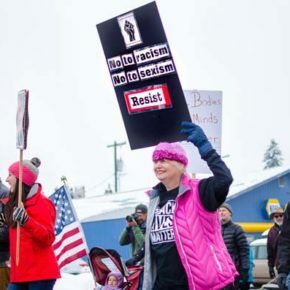 Winthrop resident Terry Karro, one of several Methow Valley women who went to Washington, D.C., said participating in the march brought tears to her eyes, especially hearing feminist leader Gloria Steinem speak. 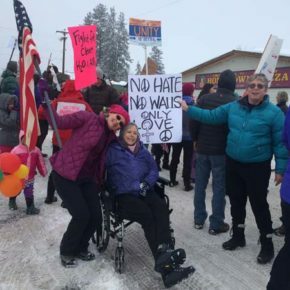 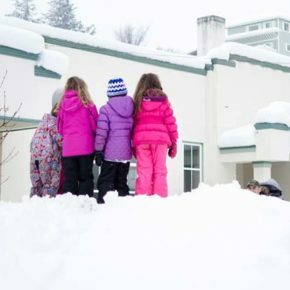 “The outstanding part of this day for us, besides the crowds which were hard to believe, was the kindness of all those people,” Karro said after returning home to the Methow Valley. 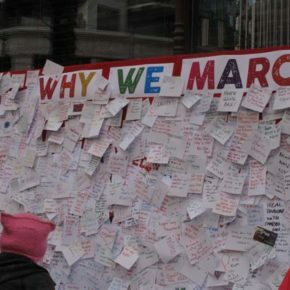 Many people submitted images of their march experience. 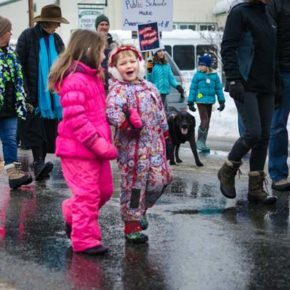 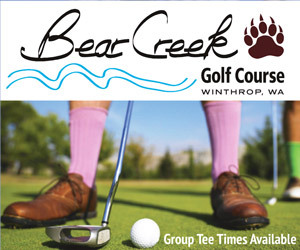 These gallery includes both submitted photos as well as photos by Methow Valley News photographers. 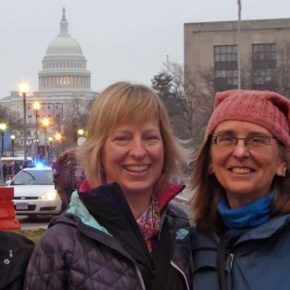 At the nation’s capital: From left, Tina Smiley (from Juneau, Alaska), and Sheela McLean, Terry Karro and Callie Fink from the Methow. 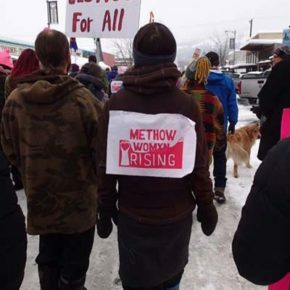 The Seattle-area march drew many people from the Methow Valley. 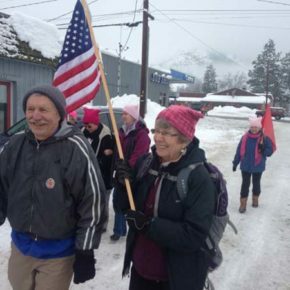 Photo by Ann McCreary Methow Valley residents rendezvoused before the Seattle march and walked together to the to the start of the march behind a banner. 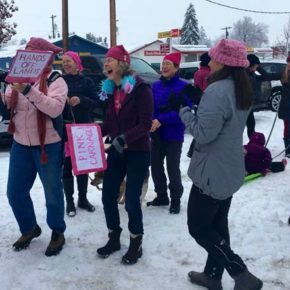 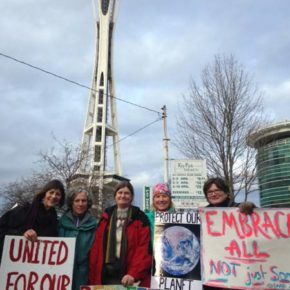 Among the Methow Valley marchers in Seattle were (from left) Ann McCreary, Jennifer Zbyszewski, KC Mehaffey, Laurie Ulmer and Beth Sinclair. 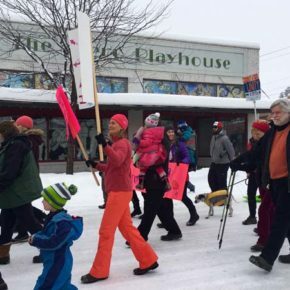 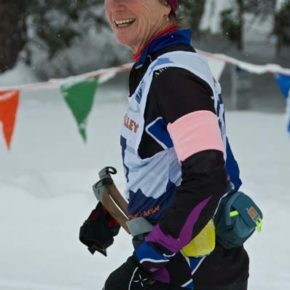 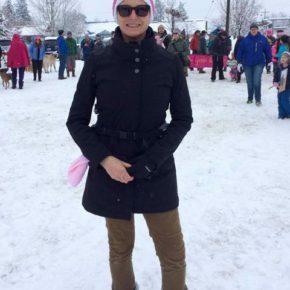 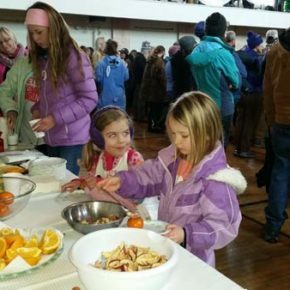 Pink armbands were handed out to skiers at the Methow Valley Nordic Festival. 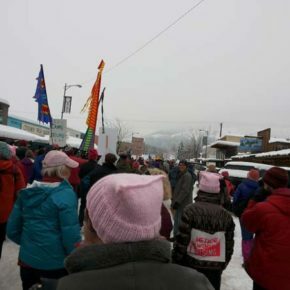 Photo by Mandi DonohueAn estimated 600 to 800 parade participants marched through Twisp on Saturday. 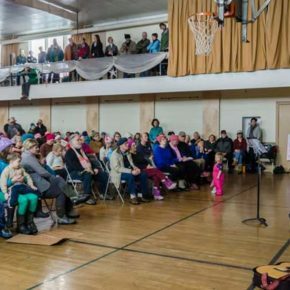 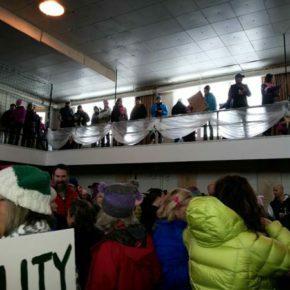 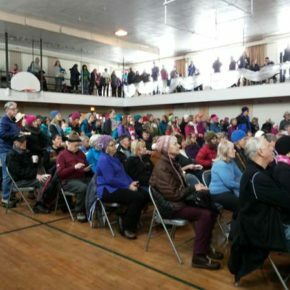 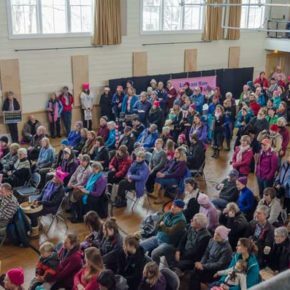 The marchers filled the community center to bursting. 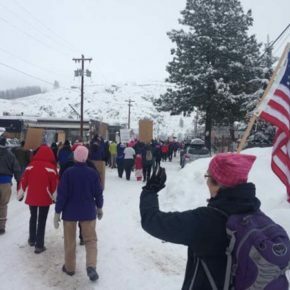 An estimated 600 to 800 parade participants marched through Twisp on Saturday.